Summary: How can you prove you're not an alcoholic? When I leaned that Ann Leary had a new novel coming out, I couldn't wait to get my hands on a copy. Fortunately, THE GOOD HOUSE mysteriously showed up in my mailbox; and it was everything I hoped it to be. This novel was smart, witty, and dark -- and very entertaining. Plus, it touched my heart and even managed to make me think. I really couldn't ask much more from a piece of fiction. THE GOOD HOUSE tells the story of Hildy, a "recovered" alcoholic who lives in a historic seaside community outside of Boston. She is a mother of two daughters, a grandmother, a successful realtor, and some would say part witch -- one of her relatives was a witch that was hung in Salem! However, Hildy is lonely and missing something in her life ever since her daughters staged an intervention and sent her to rehab for a drinking problem. When Rebecca, a young mother and wife of a wealthy man moves to town, Hildy is intrigued and the two become fast friends. Rebecca is having a hard time fitting into this close-knit community and appreciates this new friendship, and Hildy has found someone who fills a void in her life and with whom she can share a drink or two. Things take a dark turn in this cozy town when Rebecca becomes involved in a scandal. At first, Hildy tries to help her friend; however, she soon realizes that it's more important to protect herself. THE GOOD HOUSE was one of those books that I couldn't put down. I think I read it in one or two sittings, and I was so caught up in Hildy's life that I had to find out what happened to her. While there were many wonderful things about this novel, I have to say that the character of Hildy is, without a doubt, the best part. Ms. Leary did a remarkable job of creating a character that was extremely real to me -- from the way she knew everything about her hometown, to her relationship with her daughters, to her love affair with a stubborn old handyman, to her ability to keep her drinking a secret -- and I can honestly say that she will remain in my thoughts for a very long time. Another aspect of THE GOOD HOUSE which I appreciated was how well written this novel was. I've already mentioned that Hildy was such a fantastic, well-developed character, but I also loved how the story was told. The book was written in Hildy's voice and I thought the author captured her voice perfectly -- and by that I mean her sarcasm, her sneakiness, and even her honesty. I found myself laughing a great deal at Hildy's snarkiness as well as her insight into human nature; however, I also found myself touched by Hildy's loneliness and hidden insecurities. In addition, I really liked how the story unfolded and its pacing. The book was a quick read (namely because it was so well written), but there was a bit of mystery and intrigue in both Rebecca and Hildy's characters -- enough so that I consider the book a page turner. I wasn't entirely sure which direction the story was going to take, and I admit to being slightly surprised a few times. Trust me when I say that it was all very smart how everything came together. 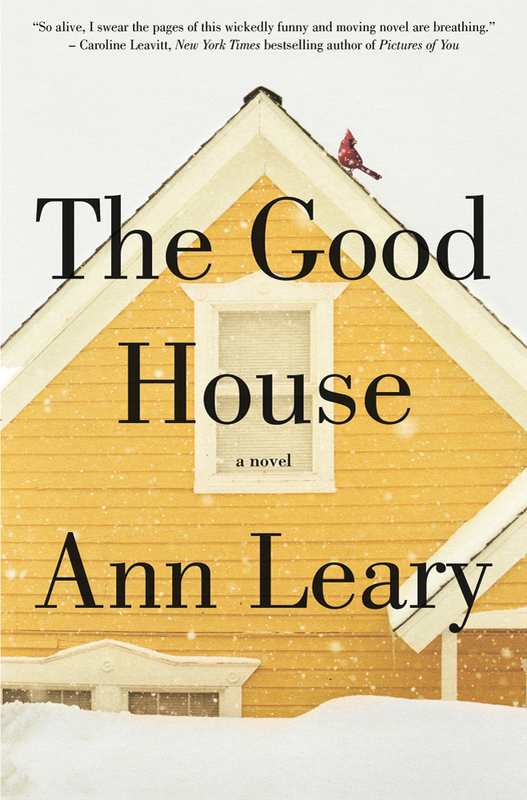 I think THE GOOD HOUSE would make a fantastic book club selection. Unfortunately, I wasn't able to find a reading guide, but I can assure you that you don't need formal questions to jump start your discussion. Hildy and Rebecca are fascinating characters in their own right, and their actions are worth loads of speculation. Some additional the themes you might want to explore include marriage, adultery, love, trust, secrets, friendship, mother/child relationships, mental illness, addiction, and redemption. I just adored THE GOOD HOUSE and highly recommend it to fans of women's fiction! Oh my gosh, I swear I've known a Hildy or two in my day. This sounds fantastic! This sounds really good! At first I thought it might sound silly but as you say it seems smarter than that! I have this loaded on my iPad and hope to read it soon. Your review is great! Yours is the second great review I've read today of this book. I am definitely adding it! This sounds like a great book and the first I have heard of it. I bet it will be popping up in more places though. Adding it to my list! I agree this sounds great. I'm not sure I would have looked at this twice before reading your review but now I'll look out for it.